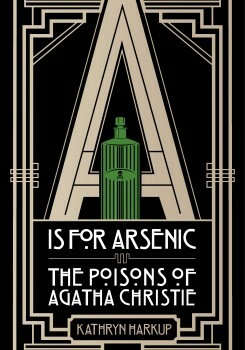 The following is an excerpt from A is for Arsenic: The Poisons of Agatha Christie, by Kathryn Harkup. Agatha Christie’s knowledge of poisons was certainly exceptional. Few other novelists can claim to have been read by pathologists as reference material in real poisoning cases. Several of the people who kindly read chapters of this book in its early stages have asked me ‘How did she know all of this?’ The answer is that her knowledge came from direct experience with poisons and a lifelong interest in the subject, though not in the criminal sense. In the First World War, Christie volunteered as a nurse at her local hospital in Torquay. She enjoyed the work but when a new dispensary opened at the hospital it was suggested that she might work there. Her new role required further training, and Christie also needed to pass examinations to qualify as an apothecary’s assistant, or dispenser, which she did in 1917. Then and for many years afterwards, doctor’s prescriptions were made up by hand in a chemist’s shop or hospital dispensary. Poisons and dangerous drugs were carefully weighed out and checked by colleagues before being dispensed. Innocuous ingredients such as colouring or flavouring could then be added according to personal taste. As Christie explained in her autobiography, this resulted in many people returning to the pharmacy to complain that their medicine didn’t look right, or didn’t taste as it usually did. As long as the drug in question had been added in the correct dose all was well, but accidents sometimes occurred. In order to prepare for the Apothecaries Hall examination Christie was tutored in practical, as well as theoretical, aspects of chemistry and pharmacy by her colleagues at the dispensary. In addition to her work and tutoring at the hospital, Agatha received private tuition from a commercial pharmacist in Torquay, a Mr P. As part of her instruction, one day Mr P. showed her the correct way to make suppositories, a tricky task that required some skill. He melted cocoa butter and added the drug, then demonstrated the precise moment to turn the suppositories out of the moulds, box them up and label them professionally as one in one hundred. * However, Christie was convinced that the pharmacist had made a mistake and added a dose of one in ten to the suppositories, ten times the required dose and potentially dangerous. She surreptitiously checked his calculations and confirmed the error. Unable to confront the pharmacist with his mistake, and frightened of the consequences of dispensing the dangerous medicine, she pretended to trip and sent the suppositories crashing to the floor, where she trod on them firmly. After she had apologized profusely and cleared up the mess, a fresh batch was made, but this time at the correct dilution. It wasn’t just Mr P.’s inattention to detail that troubled Christie. One day, he pulled a brown lump from his pocket and asked her what she thought it might be. Christie was perplexed, but Mr P. explained that it was a lump of curare, a poison originally used by hunters in South America on the tips of their arrows. Curare is a compound that is completely safe to eat but deadly if introduced directly into the bloodstream. Mr P. explained that he carried it around with him because ‘it makes me feel powerful’. Nearly fifty years later, Christie resurrected the deeply disconcerting Mr P. as the pharmacist in The Pale Horse. *i.e. one part drug per hundred in total. **Christie used grains throughout her stories, but in this book I’ll give equivalent measurements in grams (g) or milligrams (mg, thousandths of grams); one grain is equivalent to 64.79891mg.